Ian Hutchinson completed a hat-trick of wins at the 2015 Isle of Man TT Races, fuelled by Monster Energy, when he won the second Monster Energy Supersport race on Wednesday afternoon. The Team Traction Control Yamaha rider took his 11th TT victory by 14.8s from Bruce Anstey with Guy Martin taking his first podium of the week in third. At Glen Helen on the opening lap, as has often been the case this week, it was the Quattro Plant Muc-Off Kawasaki of James Hillier that led, his gap over Hutchinson one second with Anstey in third only a tenth further back. Gary Johnson, Martin and Dean Harrison completed the top six although the latter was soon out at Ballaugh. By Ramsey, Hutchinson was in the lead by a second from Hillier as Anstey closed to within two tenths of a second and with an opening lap of 127.093mph, the Bingley rider held a 3.8s advantage. Anstey was now up to second as Hillier slipped four seconds further back and was now coming under pressure from Martin. Gary Johnson and Lee Johnston were holding onto fifth and sixth but Michael Dunlop, whose participation was in doubt, retired at the pits. With perfect conditions all round the course, Hutchinson pressed on during lap two and extended his lead throughout. Indeed, in what would prove to be the fastest lap of the race, 127.751mph, the gap to Anstey, who also lapped at more than 127mph, was over eight seconds as they came into refuel at the end of lap two. Martin had moved ahead of Hillier for third whilst Johnson and Johnston maintained station. Hutchinson added a couple of seconds to his lead by the time they swept round Ramsey Hairpin for a third time but Kiwi Anstey went up and down the Mountain quicker and had brought the deficit down to 8.6s as they headed into the final lap. Martin, Hillier, Johnson and Johnston were all secure in third to sixth with a good battle for seventh taking place between the Hondas of John McGuinness, Conor Cummins and Dan Kneen. At the head of the field though, Hutchinson wasn't to be denied and once he realised Anstey was charging, he turned up the wick and came home the winner by an eventual 14.8s. 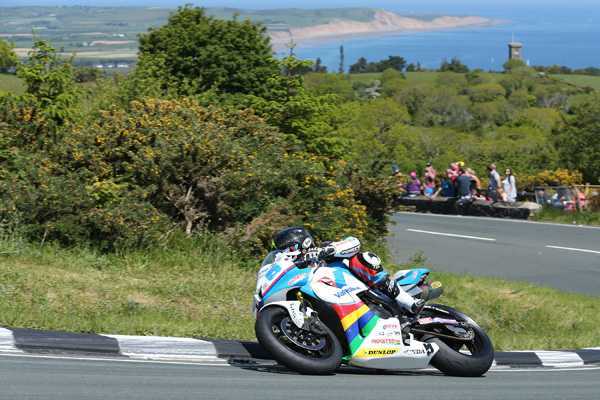 Anstey took his fourth podium of the week in second once more with Martin getting third on the Smiths Racing Triumph. Hillier put in his best ever Supersport ride to take fourth with Johnson and Johnston in fifth and sixth as they had been for much of the race. Cummins got the verdict for seventh by just 0.04s from team-mate McGuinness with Kneen and David Johnson completing the top ten. Hutchinson's win saw him move on to 95 points in the race for the TT Championship, some 23 points clear of Anstey with Hillier holding onto third on 52 points. Meanwhile, Dan Cooper continues to lead the TT Privateer's Championship with 81 points, 11 clear of Jamie Hamilton, the duo finishing 15th and 14th respectively in today's race.